What a great way to learn all about the product you build! 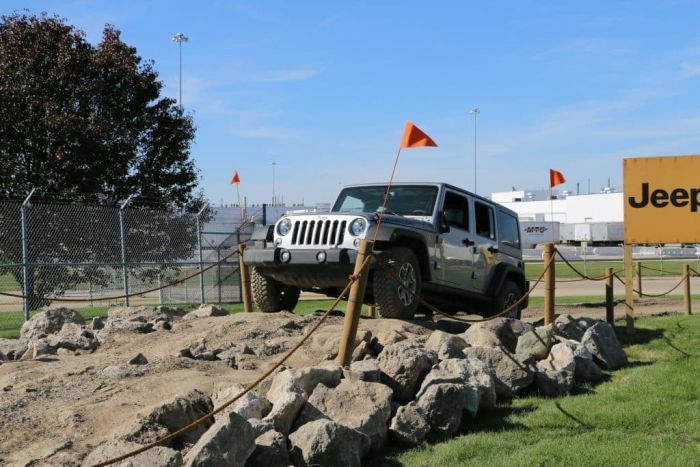 Jeep has constructed three courses outside its Jeep Toledo Assembly Complex so employees can fully appreciate why people love their Jeeps. The facility builds the all-new 2018 Jeep Wrangler, which has become one of the hottest-selling vehicles in the nation. As part of its training program, Jeep had three courses built on its property. One is a street course, one is “trail rated” giving an off-road experience and the most advanced is called the Rubicon course, named after the popular and versatile Jeep Wrangler Rubicon. Many of the Jeep Toledo employees had never driven the 2018 Jeep Wrangler. According to Jeep, employees start out riding with a professional driver on the challenging Rubicon course. Once they are more comfortable, the workers can drive the Jeeps on the trail rated course. Jeep brought in 85 tons of rock and 3,150 tons of dirt to build the trail rated course. Jeep is riding high, having recently reported its best sales month in history. According to Fiat, Jeep brand total sales rose 45 percent in March to 98,382 vehicles for its best month ever. The Jeep Wrangler led the group as sales rose 70 percent to 27,829 vehicles. It was the best month of sales ever for the nameplate, eclipsing the May 2015 record of 22,615 vehicles. The off-roading experience is just one segment of a three-part employee training program, known as the “Toledo Way”. While part of the complex was being retooled to build the all-new 2018 Jeep Wrangler employees also participated in a training program at the University of Toledo and in a variety of local community service projects.